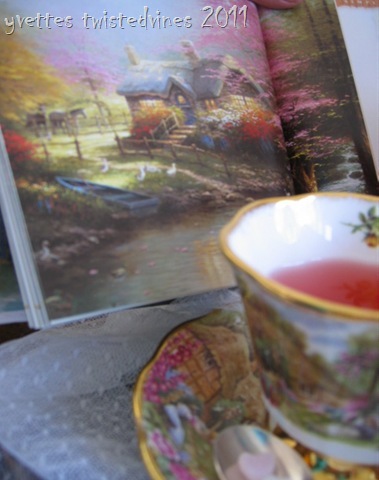 Time for a cuppa with me this afternoon and reminisce over the ‘Simple Little Pleasures’, a wonderfully written and illustrated book by Thomas Kinkade. Full of beautiful quotes and images. 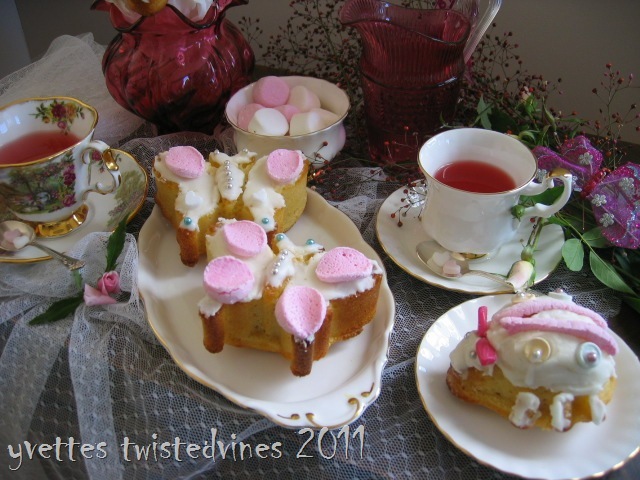 Take a few minutes and capture through my images our afternoon tea together. 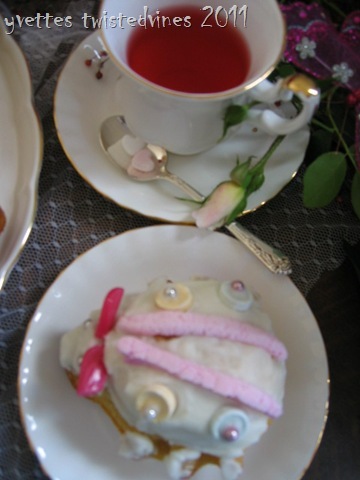 Join me in a cup of herbal infusion: Cranberry,Raspberry and Strawberry tea with butterflies,dragonflies and bugs (cupcakes). 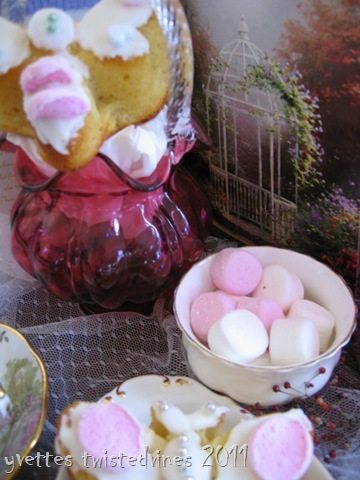 An enchanted afternoon tea. This teacup is called ‘Tranquil Garden’ – Royal Albert. The artist is Fred Errill and it’s part of the collection celebrating the 30th anniversary of Old Country Roses. ‘Simple Little Pleasures’ is beautifully illustrated with cottages, filled with enchanted gardens in full bloom, waterways and lighted windows. Portraying pure romance. 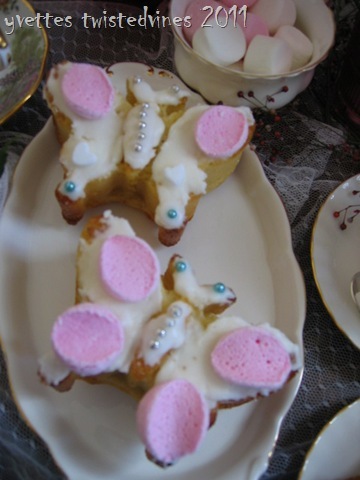 This set is Royal Albert – Val D’or. Delicate, mignon size with gold trim edging. Simplicity at it’s best! 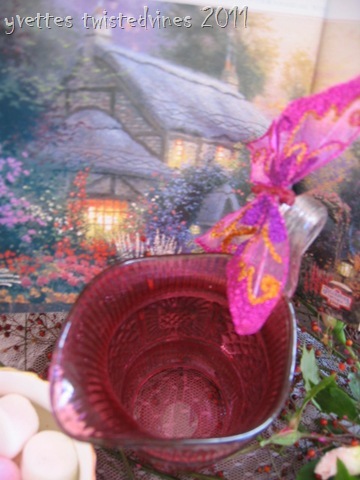 The beautiful pink glassware is Fenton. 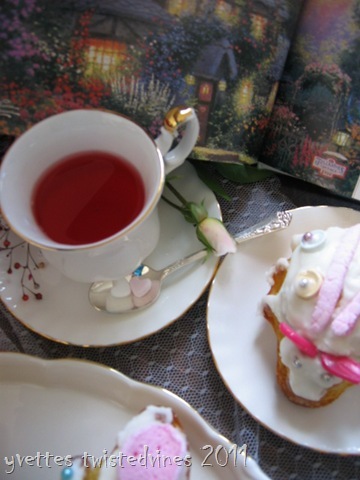 Just in these few minutes I hope you’ve enjoy tea with me and sharing my love of a little romance! Hope you also enjoyed these lovely background images as much I do….dream cottages aren’t they! Thank you for inviting me in for tea. Beautiful post Yvette. Beautiful post and a wonderful reminder to take time enjoying the pleasures of life. Simple pleasures indeed! But there isn’t anything simple about those wonderful, fun cupcakes! Delightful! Happy Tea Day! 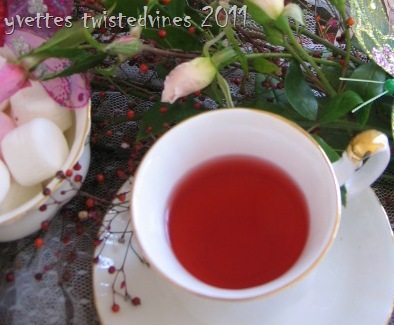 Lovely post and I adore the sweet little flowered tea cup. Romance, flowers, lace and crystal make my heart sing! I am so glad to have found your lovely blog. Your tea cups are really lovely. I love the handle on the white one and the other is stunning too! Your treats looks so delicious. Thank you so much for sharing with us. I did so enjoy tea with you! I just love your sense of whimsy in your post! The tea cups are so pretty and I really enjoy TK’s art! 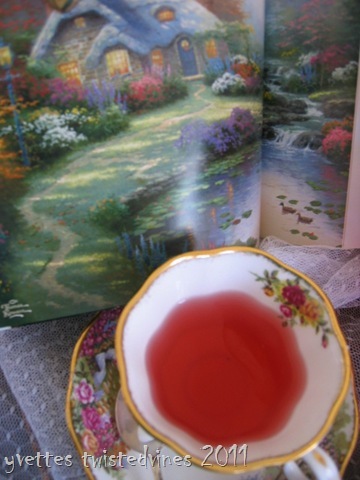 Such a wonderful and fanciful tea; loved it! Thanks for sharing. Yvette, thank you for this special and enchanting tea party. Everything looks so pretty and delicious, that I can almost taste it. Your cups are a delight, and the goodies are very fanciful. How nice to spend this time with you. I absoluetly love this post! What an utterly charming, romantic and dreamy vignette! Gardens, flowers, and those adorable cupcakes along with the teacups and tea..,lovely! Thanks so much for being a part of the fun of TTTT and also for taking part with this my 82nd, Tuesday Tea For Two, once again. We always so enjoy having you join us!